In 2010, I wrote an essay called Equitable Eclecticism: The Future of New Testament Textual Criticism, and included it in the Kindle e-book Assorted Essays on New Testament Textual Criticism. Since then, I have frequently been asked about how my text-critical approach differs from the Byzantine Priority approach and “Reasoned Eclecticism.” So, as a convenient reference, here is the essay on Equitable Eclecticism, presented in two parts (with some improvements). The textual criticism of the Gospels is a scientific task which has two goals. The primary goal is the reconstruction of the text of each Gospel in its original form, that is, the form in which it was initially received by the church. The secondary goal is the reconstruction of the transmission-history of the text. This involves both the evaluation of rival readings in specific variant-units, and the evaluation of the documents in which the readings are found. Hort, in his 1881 Introduction, argued that if superior readings are consistently found in a particular document or set of documents, in cases that seem easy to decide, then the character of the documents should be a factor when considering harder cases. Hort expressed this principle as an axiom: “Knowledge of documents should precede final judgment upon readings.” The consideration of individual variant-units should never be completely detached from the question of the relative quality of the witnesses, or from the question of how groups of variants became characteristic readings of text-types. Accurate text-critical judgments will assist in the estimation of the relative values of witnesses, and in the reconstruction of the text’s transmission-history; simultaneously, accurate assignments of relative value to the witnesses, combined with accurate reconstructions of the text’s transmission-history, will assist specific text-critical decisions. The textual critic who engages this method should vigilantly avoid circularity; the adoption of a reading because “the best manuscripts” support it ought to be a last resort. After observing, on analytical grounds, that certain witnesses seem to consistently contain the best readings, a textual critic might then be tempted to abandon the initial approach which led to that premise, and proceed to use the premise itself to justify a tendency to adopt the readings of those witnesses. Similarly, a textual critic who notices that a group of witnesses tends to contain the worst readings might be tempted to reject the remainder of the testimony of that group of witnesses. If a textual critic proceeds to build on both such premises, the premises will virtually determine the results of the rest of the analysis. The “best manuscripts” will seemingly get better and better. The model of transmission-history adopted by a textual critic has a strong effect upon the values which a textual critic assigns to the testimony of groups of witnesses, and therefore also upon the final evaluation of variants. In this respect, the approach which I advocate – Equitable Eclecticism – resembles the approach used by Hort. However, Equitable Eclecticism yields an archetype which is significantly different from the Revised Text produced by Westcott & Hort, and from the modern descendants of the Revised Text (such as the 28th edition of the Nestle-Aland Novum Testamentum Graece). This is because research and discoveries subsequent to Westcott & Hort have required the adoption of a transmission-model significantly different from the one used by Hort. Hort, building on premises developed by previous investigators, reasoned that the Byzantine Text was essentially the result of a recension that consisted of readings drawn from manuscripts with Alexandrian or Western readings; Byzantine variants were derived from the Alexandrian Text, or the Western Text, or both, or, in some cases, came into being during the recension. Hort therefore rejected all distinctive Byzantine variants. After dismissing the Western Text as the result of scribal creativity, embellishment, and a general lack of discipline (with the exception of a smattering of readings), Hort declared the Alexandrian Text (which he called the “Neutral” text) the only text-type which could possibly be regarded as the depository of the original text of the Gospels. Thus, in the approach used by Hort, the degree of favor that was given to the Alexandrian Text was matched only by the degree of disregard that was given to the Byzantine Text. The categorical rejection of Byzantine readings was a natural implications of Hort’s model of transmission-history in which the Western Text was derived from the Alexandrian Text, and the Byzantine Text was derived from both the Alexandrian Text and the Western Text. This very thing, or something very close to it, was subsequently proposed by textual critics in the 1900’s. Eminent scholars such as E. C. Colwell, G. D. Kilpatrick, and Kurt and Barbara Aland maintained, respectively, that “The overwhelming majority of readings,” “almost all variants,” and “practically all the substantive variants in the text of the New Testament” existed before the year 200. Nevertheless the Hortian text has not been overthrown. Only slightly changed, it has become entrenched in NA-28 and UBS-5 as the primary, and nearly exclusive, Greek New Testament used in seminaries. With the discovery and publication of Egyptian New Testament papyri in the 1900’s – beginning with Grenfell and Hunt’s work at Oxyrhynchus – Hort’s claim that the Alexandrian readings have a demonstrably greater antiquity than their rivals has eroded. Harry A. Sturz collected and categorized dozens of distinctive Byzantine variants which were supported by at least one early papyrus. Sturz’s data does not vindicate the entire Byzantine Text (and we should not expect it to do so). What it does do is demonstrate that Hort’s main reason for rejecting distinctive Byzantine readings was unsound. According to Hort’s transmission-model, none of the early distinctive Byzantine readings listed by Sturz should exist. The fact that they obviously did exist, even in papyri found in Egypt, demonstrates that the Byzantine Text may, at any given point, attest to an ancient distinctive reading. Hort’s theory of the origin of distinct Byzantine readings was wrong. In addition, discoveries about the texts in the papyri, in early versions, and in early parchment codices have contributed to the erosion of one of the building-blocks of Hort’s approach: the proposal that conflations in the Byzantine Text demonstrate that it is later than the Alexandrian Text and the Western Text. As Edward Miller objected in 1897, eight conflations cannot justify the rejection of the entire Byzantine Text. They may be comparable to recently minted coins dropped in an ancient well. Dr. Wilbur Pickering, in Appendix D of his book The Identity of the New Testament Text, showed that an apparent conflation exists in Codex Sinaiticus at John 13:24 (where the Alexandrian Text has και λεγει αυτω ειπε τις εστιν, the Byzantine Text has πυθεσθαι τις αν ειη, and Sinaiticus reads πυθεσθαι τις αν ειη περι ου ελεγεν, και λεγει αυτω ειπε τις εστιν). A conflation appears to occur in B at Ephesians 2:5 and at Colossians 1:12 (where the Western Text has καλεσαντι, the Byzantine Text has ικανωσαντι, and B has καλεσαντι και ικανωσαντι). 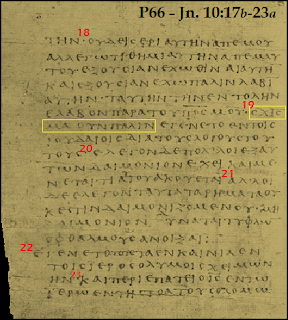 In D, a conflation appears to occur at Acts 10:48 and John 5:37 (where the Alexandrian Text – supported by P75 – has εκεινος μεμαρτυρηκεν, the Byzantine Text – supported by P66 - has αυτος μεμαρτυρηκεν, and D has εκεινος αυτος μεμαρτυρηκεν). The papyri have supplied direct evidence against Hort’s belief that apparent conflations imply that the text in which they are found must be late. In P53, the text of Matthew 26:36 seems to read ου αν, where the Byzantine text has ου and the Alexandrian Text and Western Text have αν. 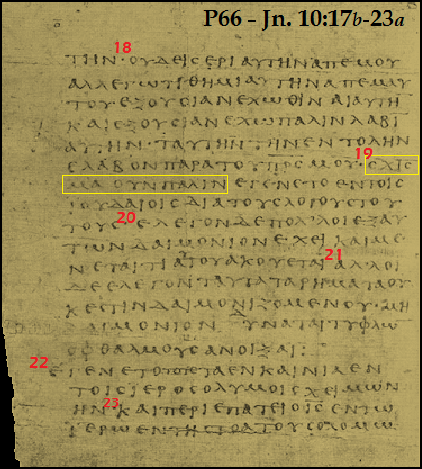 Papyrus 66 reads σχισμα ουν παλιν at John 10:19 (agreeing with the Byzantine Text), where the Alexandrian Text has σχισμα παλιν and the Western Text has σχισμα ουν. Similarly, P66 reads εβαστασαν ουν παλιν at John 10:31 (again agreeing with the Byzantine Text), where the Alexandrian Text has εβαστασαν παλιν and the Western Text has εβαστασαν ουν. Ironically, as the papyri-discoveries took away the pedestal upon which Hort’s transmission-model had stood, they also tended to exonerate Hort’s favored text of the Gospels, the Alexandrian Text, by demonstrating the high antiquity of the Alexandrian text of Luke and John. Papyrus 75, in particular, possesses a remarkably high rate of agreement with B. This shows that the Alexandrian Text of Luke and John was carefully preserved in the 200’s, and this has tended to alleviate the suspicions of some earlier scholars that the Alexandrian Text was the result of editorial activity in the 200’s. The correspondence between Papyrus 75 and Codex B was interpreted by some textual critics as a demonstration of the antiquity and superiority of the entire Alexandrian Text. Kurt Aland compared the situation to sampling a jar of jelly or jam: a mere spoonful is enough to show what is in the rest of the jar. However, although the agreement between P75 and B proves that the Alexandrian Text of Luke and John is not the result of scribal editing conducted in the 200’s, it did not prove that Alexandrian readings are not results of earlier scribal editing. Nor did Papyrus 75 prove that the Byzantine Text is less ancient than the Alexandrian Text. It shows what kind of Gospels-text (or at least, major parts of the Gospels-text) was in use in Upper Egypt in the early 200’s. It does not constitute evidence about what form of text was used, or was not used, in other places. The discovery of the papyri led some textual critics to advocate an undue emphasis upon the ages of witnesses, resulting in a lack of equity toward variants with no support in Egypt. Because the Egyptian climate allowed the preservation of papyrus, the oldest copies will almost always be copies from Egypt. To favor the variant with the oldest attestation is to tilt the playing-field, so to speak, in favor of whatever readings are found in whatever manuscripts were stored in the gentlest climate. But this is no more reasonable than favoring the variants of a manuscript because it was found closer to the equator than other manuscripts. Certainly when two rival variants are evaluated, and the first is uniformly attested in early witnesses, while the second is found exclusively in very late witnesses, the case for the first one is enhanced. But to assign values to witnesses according to their ages without considering factors such as climate is to introduce a lack of equity into one’s analysis. The papyri-discoveries elicited another interesting development. Before Hort, pioneering scholars such as Griesbach had organized witnesses into three main groups – Western, Byzantine, and Alexandrian. Each group, characterized by consistent patterns of readings, was considered a text-type, and manuscripts sharing those special patterns of readings were viewed as relatives of one another. Hort then divided the Alexandrian group into two text-types, calling its earlier stratum the “Neutral” text, supported by Sinaiticus and Vaticanus. Then, following analysis by Kirsopp Lake, the Caesarean text of the Gospels was added. But the evidence from the papyri indicates that even in a single locale (Egypt), the text existed in forms other than those four. Consider Papyrus 45, a fragmentary copy of the Gospels and Acts from the early 200’s (or slightly earlier). In Mark 7:25-37, when P45 disagrees with either B or the Byzantine Text or both, P45 agrees with B 22% of the time, it agrees with the Byzantine Text 30% of the time, and 48% of the time it disagrees with them both. Such departures from the usual profiles of text-types has led some textual critics to reconsider the existence of early text-types, arguing instead that the text in the 100’s and 200’s was in a state of fluctuation. A plausible alternative is that some of the papyri attest to the existence of localized text-forms which became extinct, without implying that the Western, Byzantine, and Caesarean forms did not exist prior to the 300’s. In the late 1800’s, Westcott & Hort’s Greek text of the New Testament faced several obstacles. First was the popularity of the Textus Receptus, which, as the base-text of the King James Version, had the status of an ancient landmark in English-speaking countries, regardless of how carefully attempts were made to demonstrate that its Reformation-era compilers, or some stealthy editors in ancient times, were the real landmark-movers. Eberhard Nestle wrote an enthusiastic recommendation of this handy Greek New Testament; his brief review appeared in the Expository Times in June of 1898. He pointed out how “disgraceful” it would be to continue to circulate Erasmus’ errors in Rev. 17:8 and Rev. 22:19-21. He invited the British and Foreign Bible Society to begin to circulate Novum Testamentum Graece instead of the Textus Receptus. In 1904 the British and Foreign Bible Society began circulating the fourth edition of Novum Testamentum Graece. Its editor: Eberhard Nestle. While that was happening, a scholar named Hermann von Soden was in the process of compiling an edition of the Greek New Testament which textual scholars expected to become definitive, superseding all previous editions. But when von Soden’s Greek New Testament was released in 1902-1911, it was found to be extremely cumbersome, and it was flawed in various ways. Nestle’s Novum Testamentum Graece was on hand to meet the need of seminarians and other textual researchers, and it has done so ever since – and it eventually was adopted, in later editions, as the primary base-text for new translations. It is as if the papyri (and the research into early versions, and the revisions of patristic writings, and other significant discoveries and research undertaken in the 1900’s) have scarcely had an impact, whereas in reality they cracked the transmission-model that was a large part of the foundation of the Westcott-Hort compilation. The marketplace for Greek New Testaments in the early 1900’s rapidly became crowded: Bernard Weiss, Alexander Souter, and J. M. S. Baljon made compilations which rivaled Nestle’s. F. H. A. Scrivener’s editions of the Textus Receptus remained in circulation. Thomas Newberry’s 1870 Englishman’s Greek New Testament – an interlinear edition of the Textus Receptus which featured a presentation of variants adopted by textual critics prior to Westcott & Hort (Griesbach, Lachmann, Tregelles, Tischendorf, Alford, and Wordsworth) – also remained in print. The public generally had to choose between either a Greek text similar to the 1881 revision of Westcott & Hort, or the Textus Receptus. That changed in 1982, when Zane Hodges and Arthur Farstad published a compilation called The Greek New Testament According to the Majority Text. As its name implies, this text was intended to consist of the readings shared by the majority of Greek manuscripts. Hodges and Farstad proposed that the Alexandrian Text is a heavily edited, pruned form of the text, and that the Majority Text is much better, inasmuch as “In any tradition where there are not major disruptions in the transmissional history, the individual reading which has the earliest beginning is the one most likely to survive in a majority of documents.” The work of Hodges and Farstad was the basis for many text-critical footnotes in the New Testament in the New King James Version, which was published around the same time under Dr. Farstad’s supervision. A similar work was released in 1991 by Maurice Robinson and William Pierpont, called The New Testament in the Original Greek According to the Byzantine/Majority Textform. A second edition was published in 2005. Rejecting any notion of defending the Textus Receptus (which differs from the Byzantine Text at over 1,800 points, about 1,000 of which are translatable), Robinson and Pierpont regarded the Byzantine Text as virtually congruent to the original text. The Byzantine Textform consists of a series of majority readings, wherever majority readings clearly exist. Outside the pericope adulterae (John 7:53-8:11) and the book of Revelation, almost no analytical attempts to reconstruct the relationships of variants within the Byzantine tradition seems evident, since the question is usually settled by a numerical count (or, by a consultation of representative manuscripts, using data from von Soden’s work). In some respects, Hodges & Farstad and Robinson & Pierpont have paved a trail that was blazed in the 1800’s by John Burgon, who opposed the theories of Westcott & Hort. Burgon’s aggressive writing-style sometimes overshadowed his argumentation; nevertheless some of his views have been vindicated by subsequent research. For example, Hort asserted that “even among the numerous unquestionably spurious readings of the New Testament there are no signs of deliberate falsification of the text for dogmatic purposes,” but Burgon insisted that the opposite was true. Burgon’s posthumously published Causes of Corruption (1896) even included a sub-chapter titled “Corruption by the Orthodox.” Almost a century later in 1993, a variation on Burgon’s theme was upheld by Bart Ehrman in the similarly titled book The Orthodox Corruption of Scripture. As a result, although Ehrman exaggerated his case in many respects, no textual critics now consider Hort’s assertion to be correct. Many scholars and interested bystanders, noticing that the weaknesses of several of Hort’s key premises and assertions have been exposed, have been willing to consider the model of transmission-history proposed by the supporters of the Byzantine Textform. Others have irresponsibly attempted to associate it with the fundamentalist doctrine of King James Onlyism. Others have rejected it because, despite detailed lists of principles of internal and external evidence in Dr. Robinson’s essay The Case for Byzantine Priority, the factor that usually determines the adoption of a variant in the approach advocated by Robinson is its attestation in over 80% of the Greek manuscripts. Patristic evidence and the testimony of early versions are not included in the equation of what constitutes the majority reading. Distinctive Alexandrian variants, Western variants, Caesarean variants, and even minority readings attested by the oldest Byzantine witnesses (such as parts of Codices A and W) have no chance of being adopted; generally, if a variant is supported by over 80% of the Greek manuscripts, it is adopted. The validity of such an approach depends upon the validity of the premise that the transmission of the text of the Gospels was free from “major disruptions.” However, major disruptions have had enormous impacts upon the transmission of the text. Roman persecutions – followed by Roman sponsorship – wartime and peacetime, dark ages and golden ages – all these things, plus innovations and inventions related to the copying of manuscripts, drastically changed the circumstances in which the text was transmitted, and while all text-types were affected by them, they were not all affected to the same extent. It is no more scientifically valid to adopt a reading because it was favored in Byzantine scriptoriums than it is to adopt a reading because the manuscripts that support it were kept in an area with low humidity (namely Egypt) and thus lasted longer than the manuscripts in other places. "In D, a conflation appears to occur at Acts 10:48 and John 5:37"
A comma would be helpful here. The conflation at Acts 10:48 involves an expansion of the NS to κυρίου Ἰησοῦ Χριστοῦ in a verse crucial to the Trinitarian controversy. A lot of scholars and interested bystanders tend to notice that the weakpoint in numerous hort's key premises. thanks for this nice post!